The Diabla Burdel is the tequila take on a Sazerac. 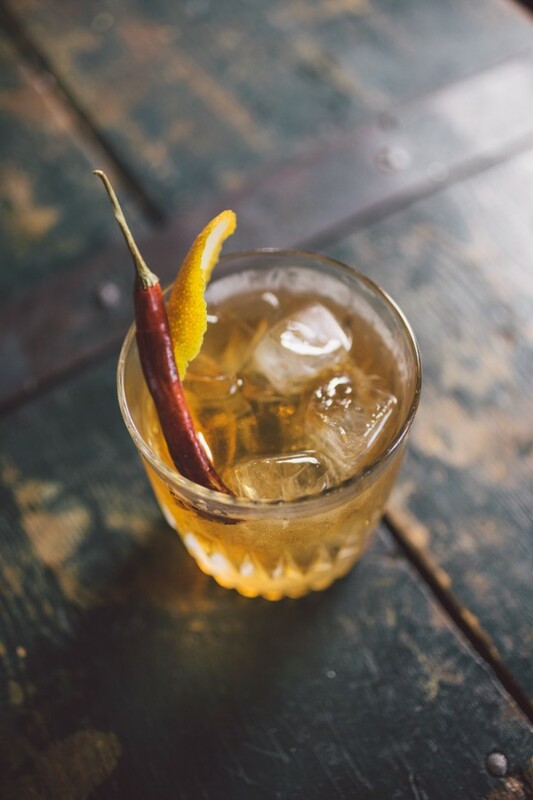 Developed at Belle’s Cocktail House in Lexington, Kentucky, the name takes its cue from the spicy chili infused tequila and the Madam Belle Brezing’s most orderly of disorderly houses. This cocktail took 9 weeks to prep - but goes down much faster! First, we filled a mason jar with Corazon Tequila, whole chili peppers, and cinnamon sticks. Taste testing happened over a week’s time till we hit our desired level of spicy. Then, we added Herbsaint to the tequila and filled a 10L bourbon barrel that had previously aged a Boulevardier. The mixture sat for 8 weeks, then was poured over ice, mixed with a couple dashes of orange and Aztec chocolate bitters, and served with an orange peel and a chili pepper garnish. The barrel rounds the heat and spice from the tequila with the Herbsaint without losing flavor for the perfect Halloween cocktail. Feel the burn? Age 3 Parts Chili and Cinnamon Infused Tequila and 1 Part Herbsaint in Bourbon Barrel. Pour 3 oz Mixture over ice, and add 3 dashes each of Orange and Aztec Chocolate Bitters. Garnish with chili pepper and orange peel and enjoy!